With the two big climbs over 1.3-kilometer freestyle sprint course, the women’s World Cup freestyle sprint course in Lillehammer, Norway packs a quad-burning punch. With lungs then legs poaching any extra oxygen, the women’s final, which featured four of six athletes from Sweden, was a primetime show. Nilsson is a finisher, known for her closeout efforts in the finishing straight. But as she and twenty-three-year-old Sundling glided into the S-turns before the final 100 meters, Sundling’s skis looked to have a glide-advantage. It didn’t take long down the stretch for Sundling to pass Nilsson for her first career World Cup victory. She won in a time of 2:52.74 minutes. 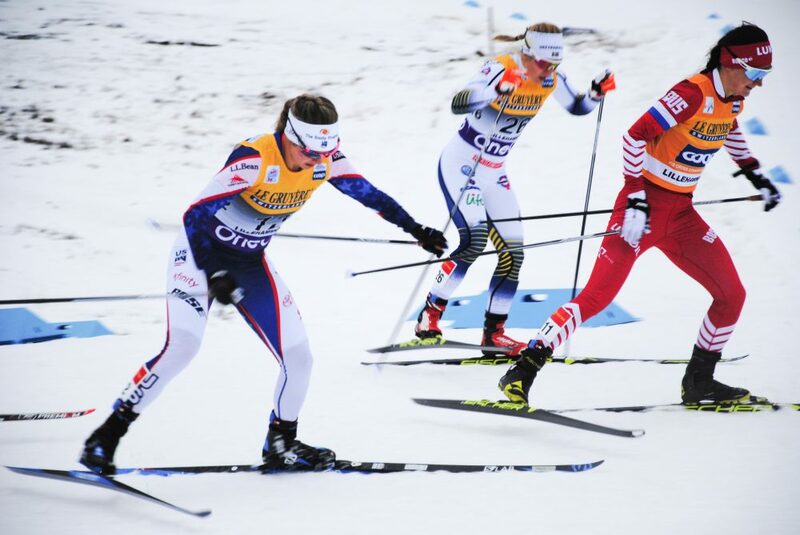 This was Sundling’s 29th World Cup start, and her second podium. She placed second last season in Falun’s skate sprint. Sundling qualified for the heats in 26th (+5.74). She advanced to the semis by winning the first heat. However, she was a lucky loser in the first semi-final to advance to the six-skier final. Nilsson placed second (+.34), the U.S. Ski Team’s (USST) Sadie Bjornsen was third (+3.03). For Bjornsen, she showed the early season form reminiscent of last season. 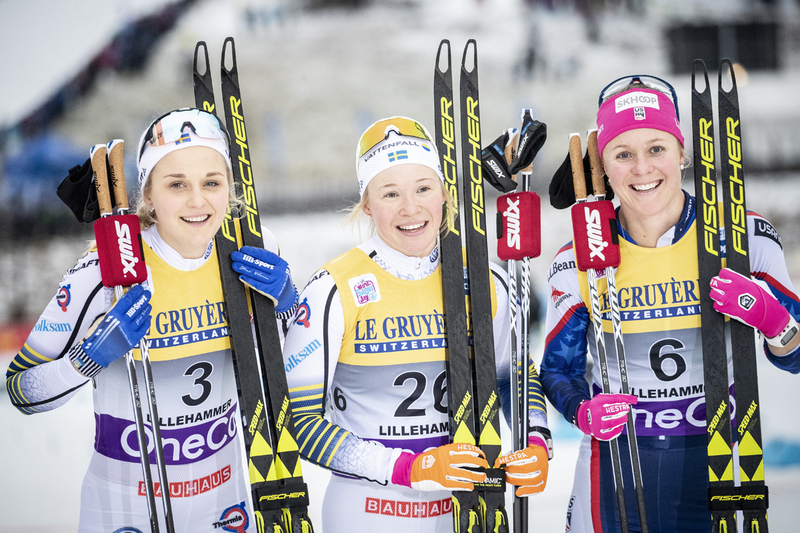 During the 2017-2018 World Cup, Bjornsen posted a second place during the first weekend’s classic sprint, and a third place in the Lillehammer classic sprint the following weekend. This season, Bjornsen skied to an 11th place in the Ruka, Finland classic sprint and an 11th in the 10 k classic. With her near-the-front-of-the-pack skiing today, Bjornsen skied with assertiveness and confidence on her way to securing her first career World Cup skate sprint podium. It was Bjonrsen’s sixth career podium on the World Cup circuit. Bjornsen displayed keen instincts on the final climb. Even more impressive was her display of horsepower as she took a seam up the right-hand side, and began gapping fourth, fifth, and sixth place behind her. “Then coming into the finish, I tried to start free skating like three seconds before I wanted to because I knew that that speed would carry me across the finish,” Bjornsen said. Bjornsen was the fastest North American qualifier in sixth, 1.88 seconds behind the speediest qualifier, Sweden’s Hannah Falk, who stopped the clock in 2:56.43 minutes. Bjornsen advanced to the semis by placing second to Falk in the third heat. It was déjà vu in the second semi-final, where Bjornsen again placed second to Falk to secure a spot in the final. Bjornsen enters Saturday’s 10 k individual start classic in third overall for the Lillehammer three-day tour. The U.S. Ski Team’s Jessie Diggins skiing next to Russia’s Yulia Belorukova in the second heat during Lillehammer, Norway’s 1.3 k World Cup freestyle sprint. Diggins placed 17th overall. After qualifying ninth and 12th respectively, U.S. skiers Rosie Brennan (APU) and Jessie Diggins (USST) did not advance to the semi-finals. Diggins and Brennan raced in the second heat. Diggins placed fourth, Brennan fifth. Diggins finished the day in 17th, Brennan 21st. Also for the U.S., Ida Sargent (USST) qualified 34th (+7.28), Kelsey Phinney (SMS T2) in 38th (+8.76), Caitlin Patterson (CGRP) 59th (+13.18), and Kaitlynn Miller (CGRP) 73rd (+20.78). USST athlete Sophie Caldwell did not start as she is fighting a cold. Racing continues tomorrow for the women with a 10 k interval start classic race.